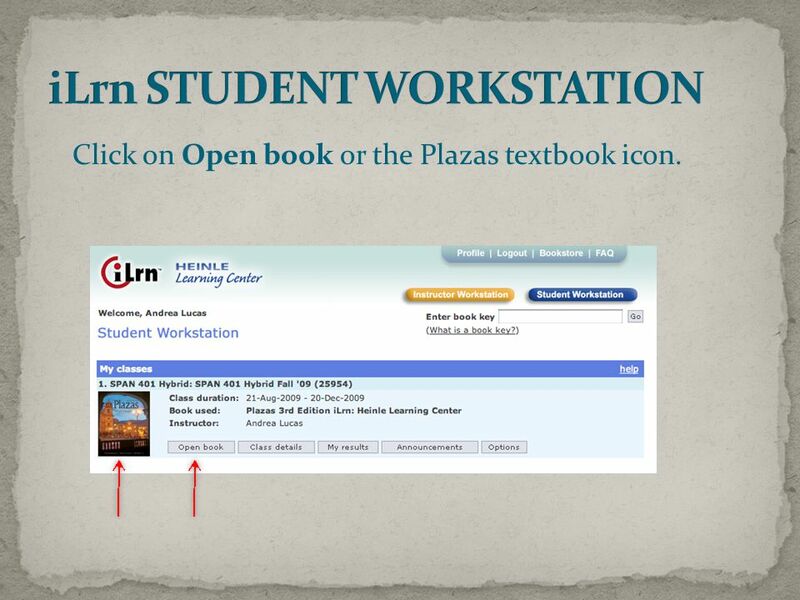 PLAZAS iLrn STUDENT WORKSTATION. If you don’t have an account click on Students to create one. 2 If you don’t have an account click on Students to create one. 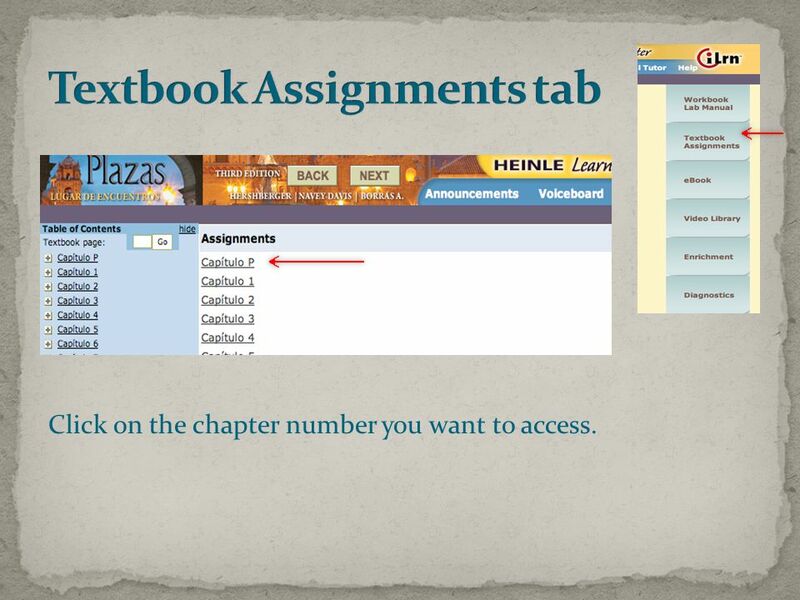 3 Click on Open book or the Plazas textbook icon. 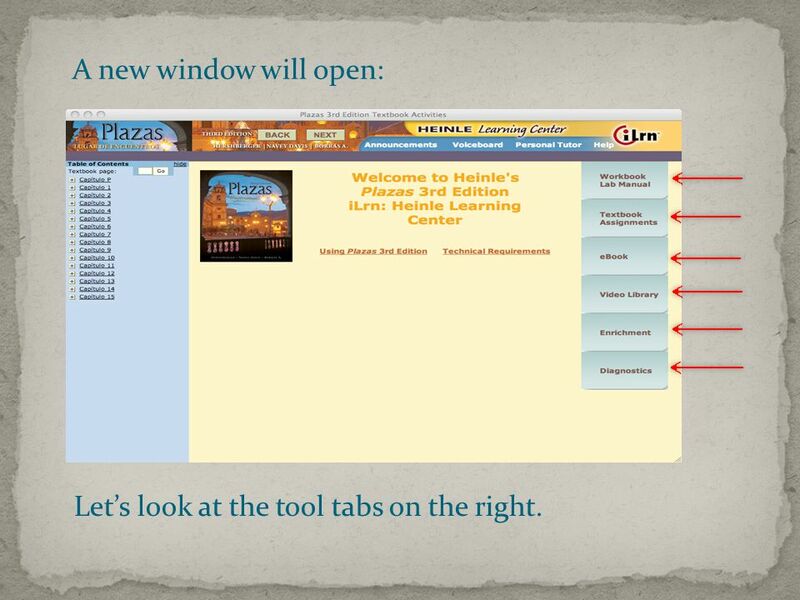 4 A new window will open: Let’s look at the tool tabs on the right. 5 Click on workbook to access the written exercises. 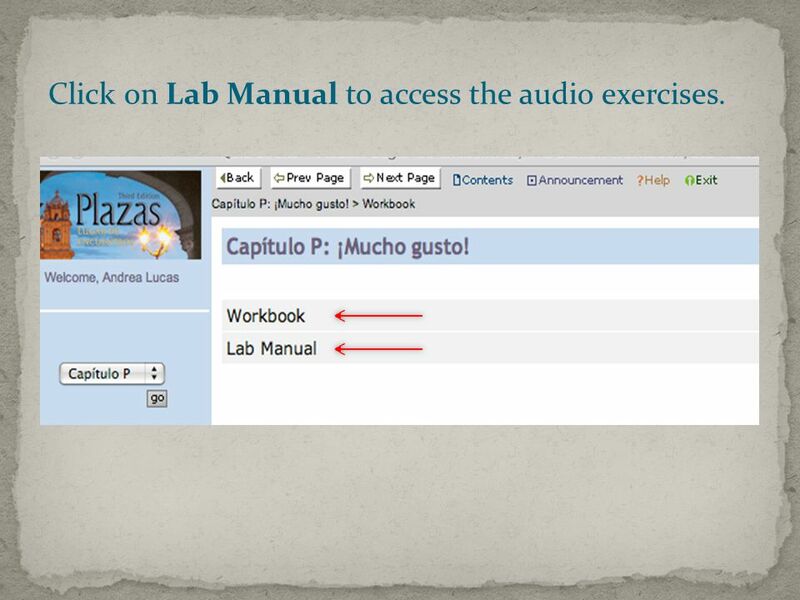 6 Click on Lab Manual to access the audio exercises. 7 You will see a list of exercises and their due dates. 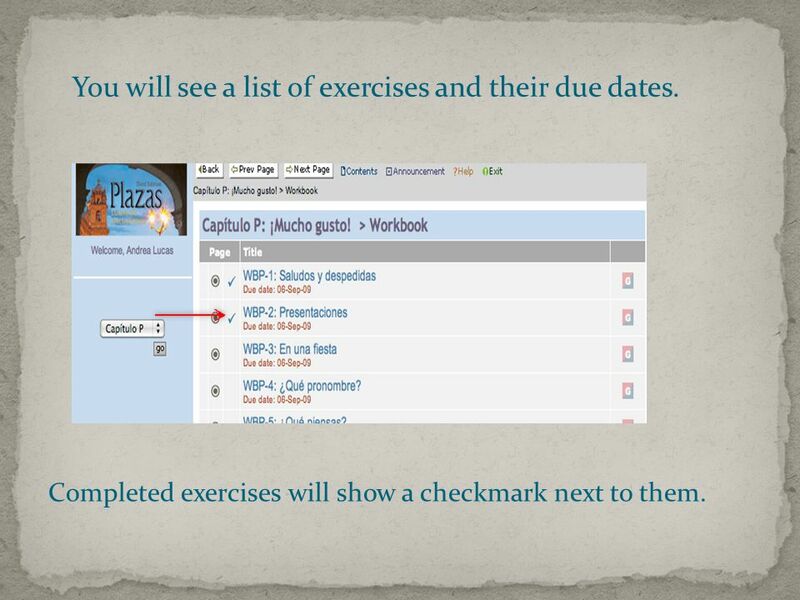 Completed exercises will show a checkmark next to them. 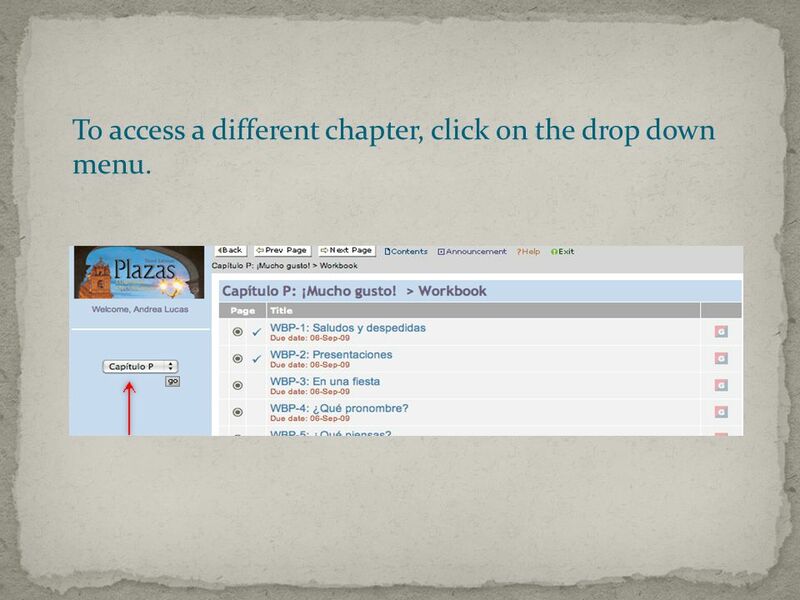 8 To access a different chapter, click on the drop down menu. 9 Click on the chapter number you want to access. 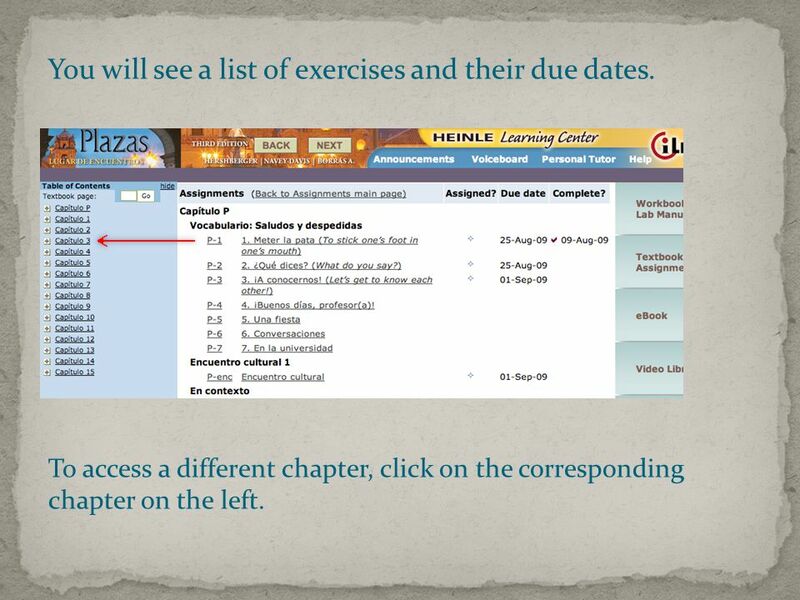 10 You will see a list of exercises and their due dates. To access a different chapter, click on the corresponding chapter on the left. 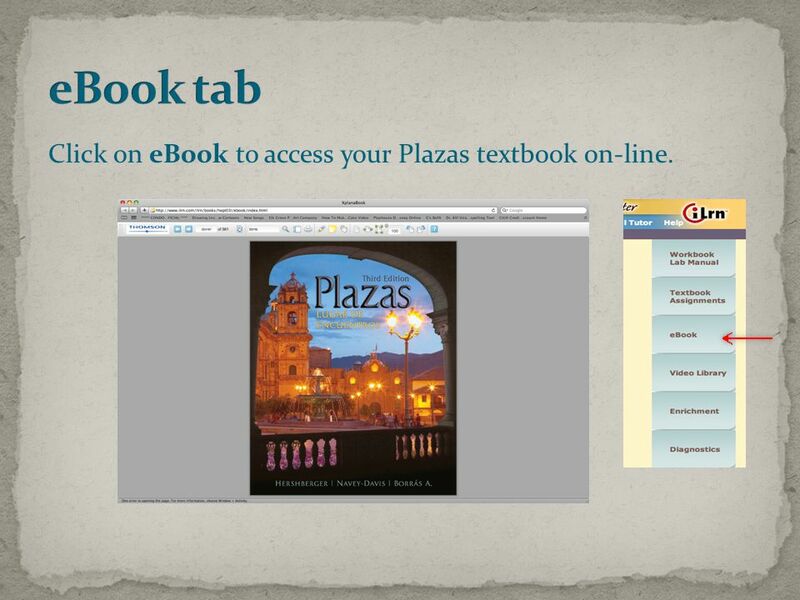 11 Click on eBook to access your Plazas textbook on-line. 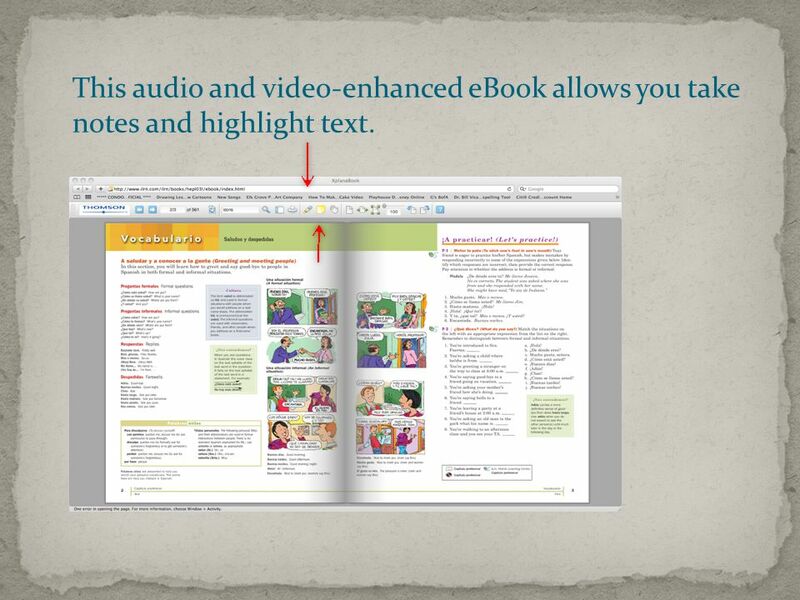 12 This audio and video-enhanced eBook allows you take notes and highlight text. 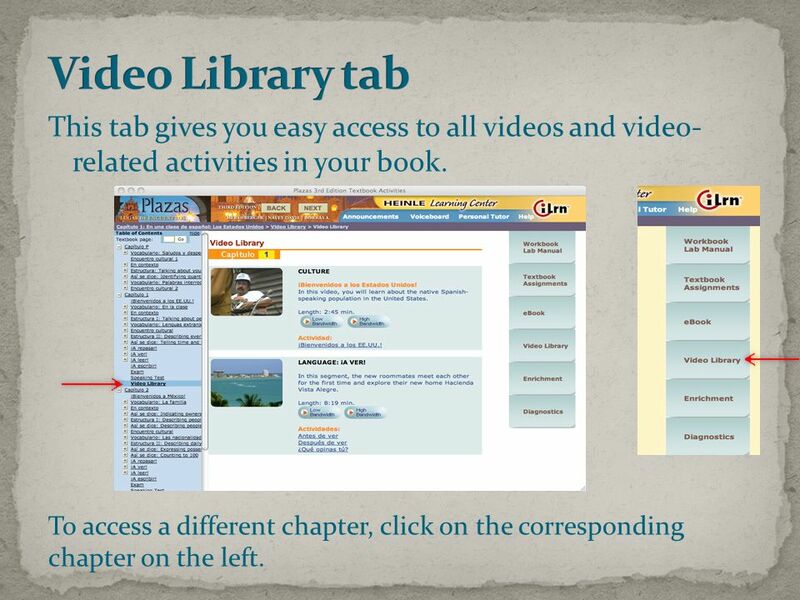 14 This tab gives you easy access to all videos and video- related activities in your book. To access a different chapter, click on the corresponding chapter on the left. 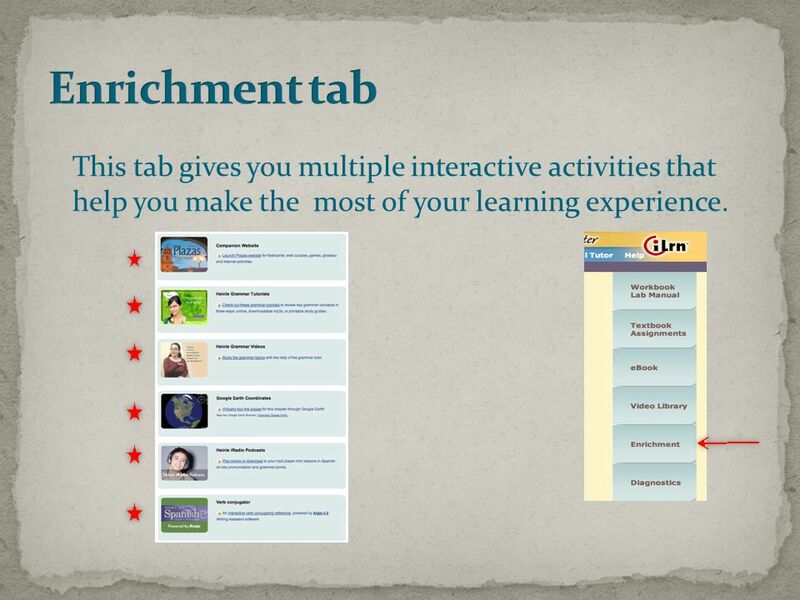 15 This tab gives you multiple interactive activities that help you make the most of your learning experience. 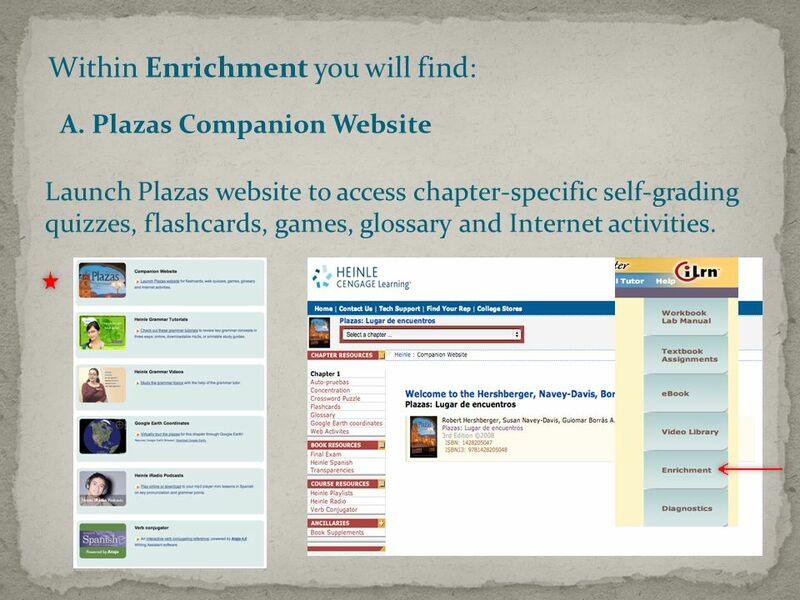 16 Within Enrichment you will find: A. Plazas Companion Website Launch Plazas website to access chapter-specific self-grading quizzes, flashcards, games, glossary and Internet activities. 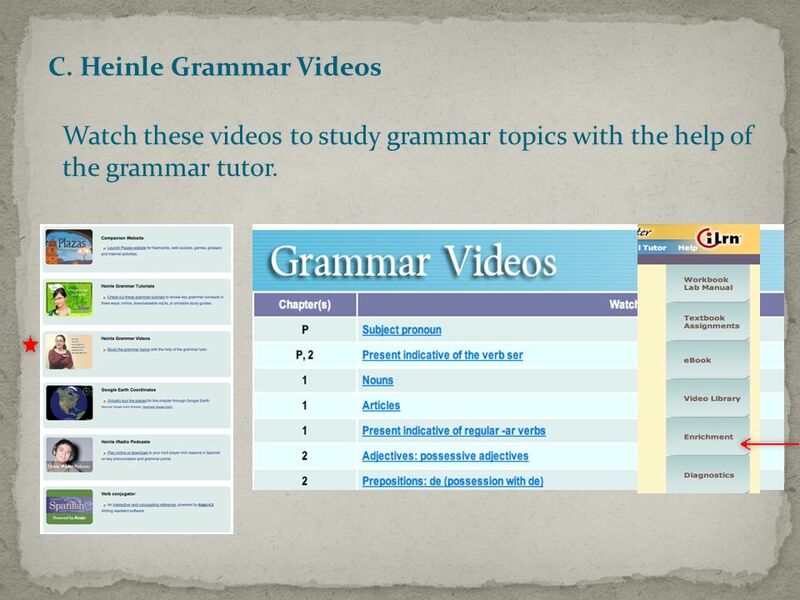 18 C. Heinle Grammar Videos Watch these videos to study grammar topics with the help of the grammar tutor. 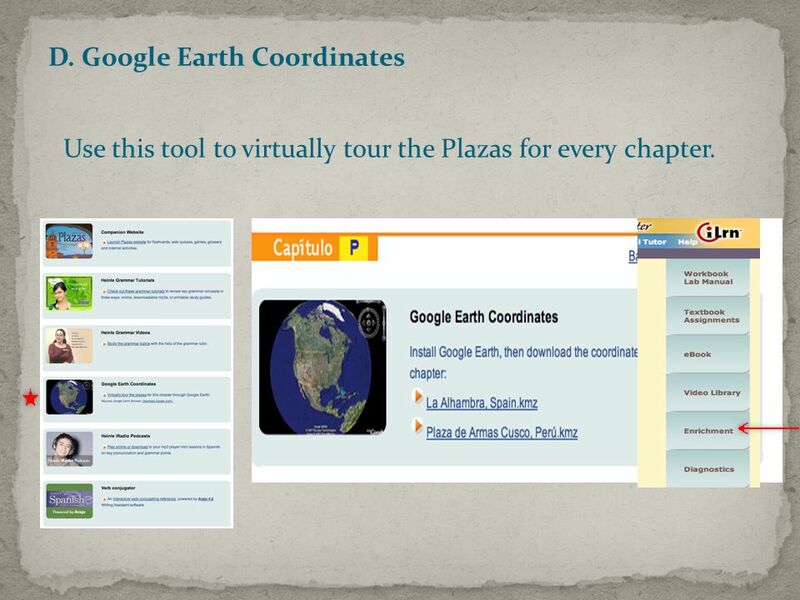 19 D. Google Earth Coordinates Use this tool to virtually tour the Plazas for every chapter. 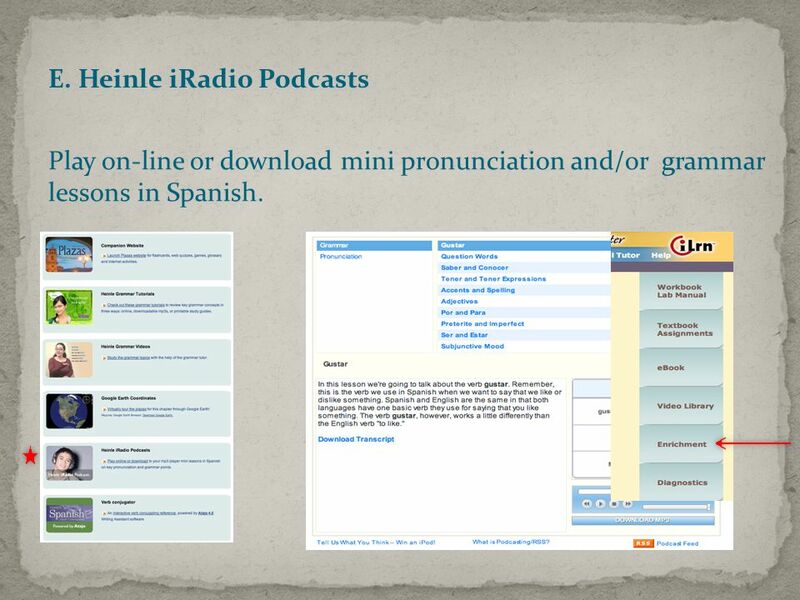 20 E. Heinle iRadio Podcasts Play on-line or download mini pronunciation and/or grammar lessons in Spanish. 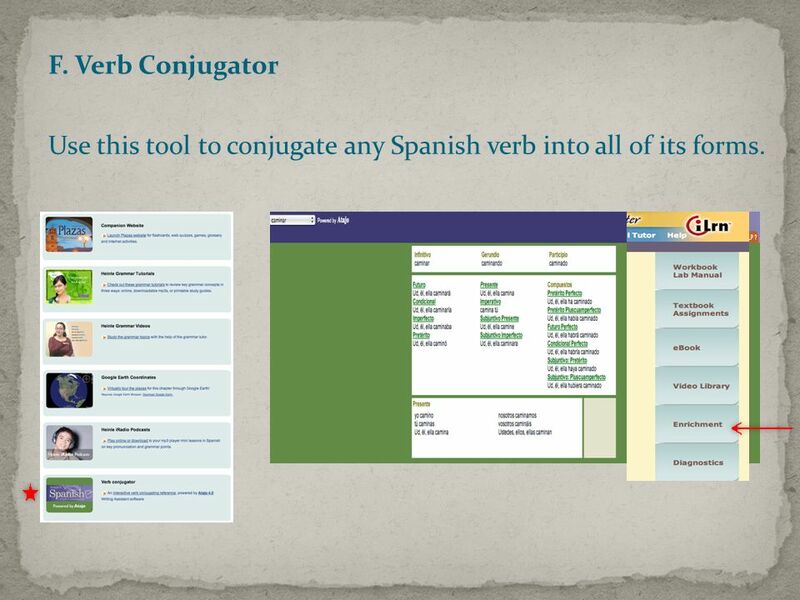 21 F. Verb Conjugator Use this tool to conjugate any Spanish verb into all of its forms. 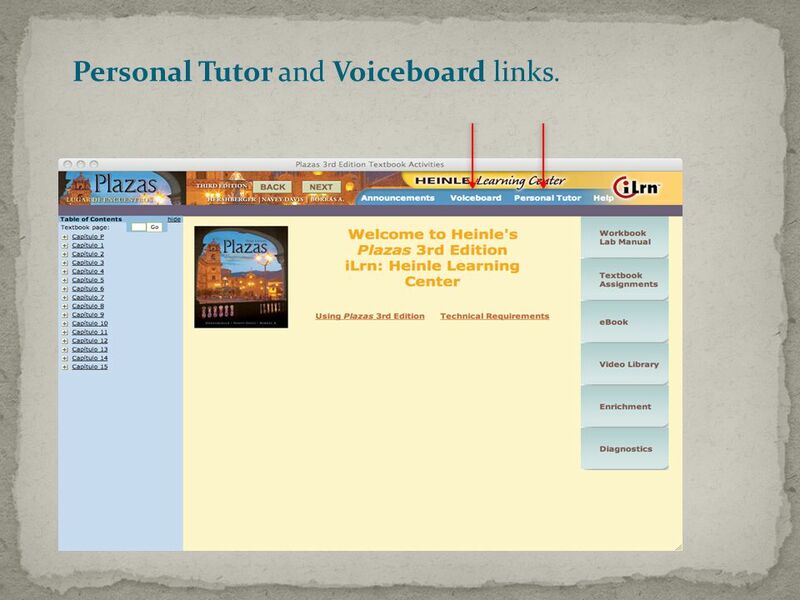 23 Personal Tutor and Voiceboard links. 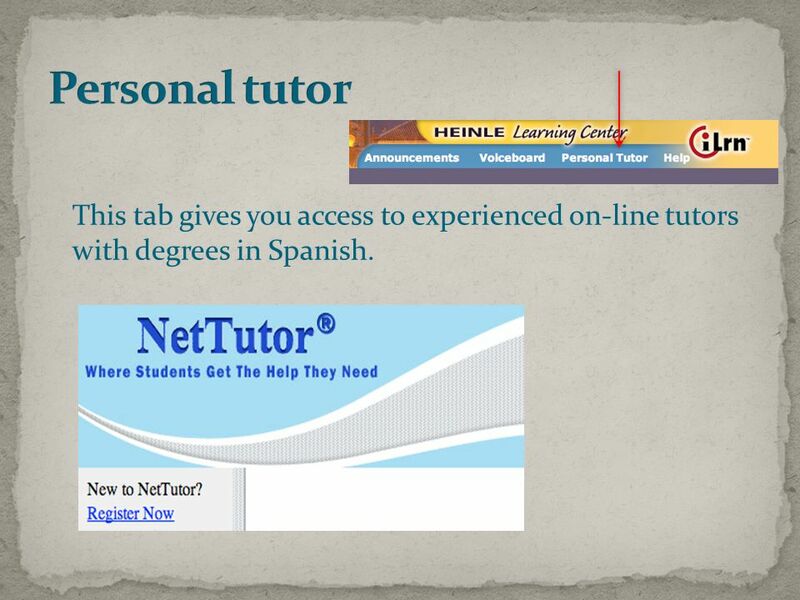 24 This tab gives you access to experienced on-line tutors with degrees in Spanish. 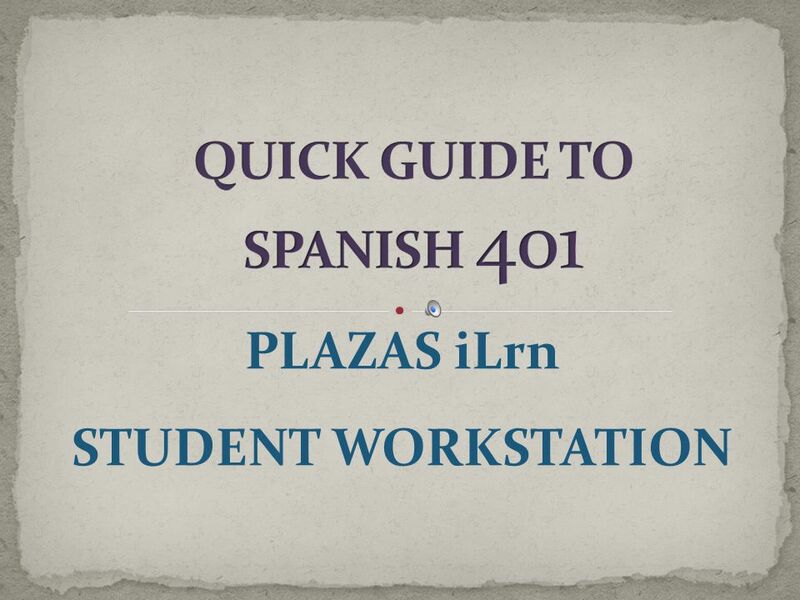 Download ppt "PLAZAS iLrn STUDENT WORKSTATION. 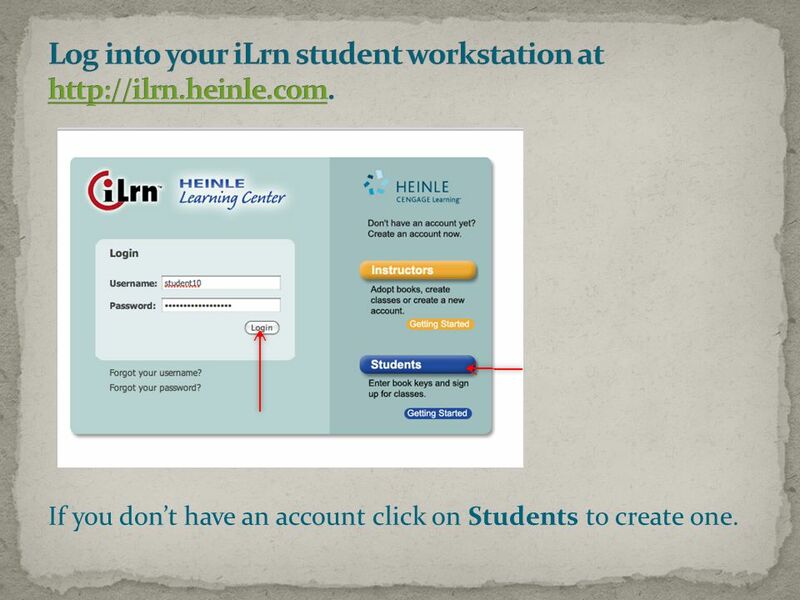 If you don’t have an account click on Students to create one." Support.ebsco.com Poetry & Short Story Reference Center Tutorial. 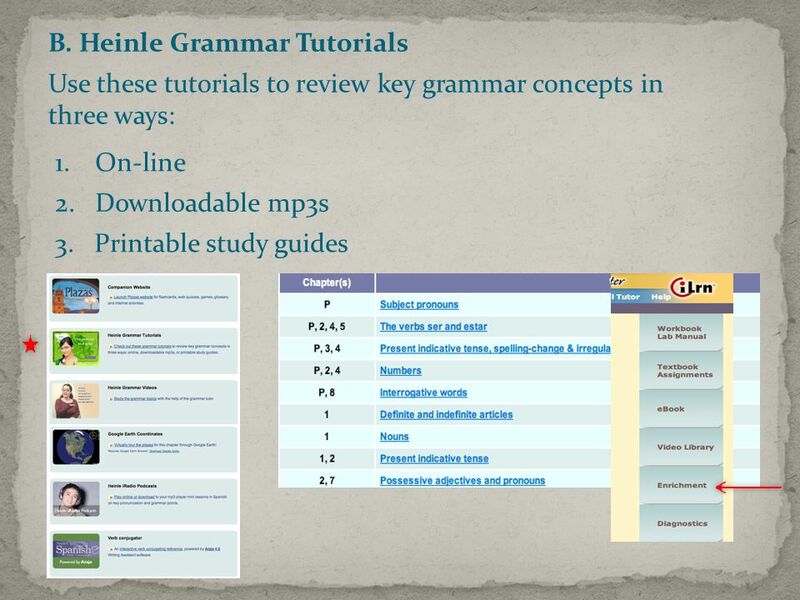 Using CONNECTschool ™ McGraw Hill Ryerson. What is CONNECTschool™? CONNECTSchool™: A web-based program that includes a searchable eBook, interactive teaching. Using CONNECTschool McGraw Hill Ryerson. What is CONNECTschool? 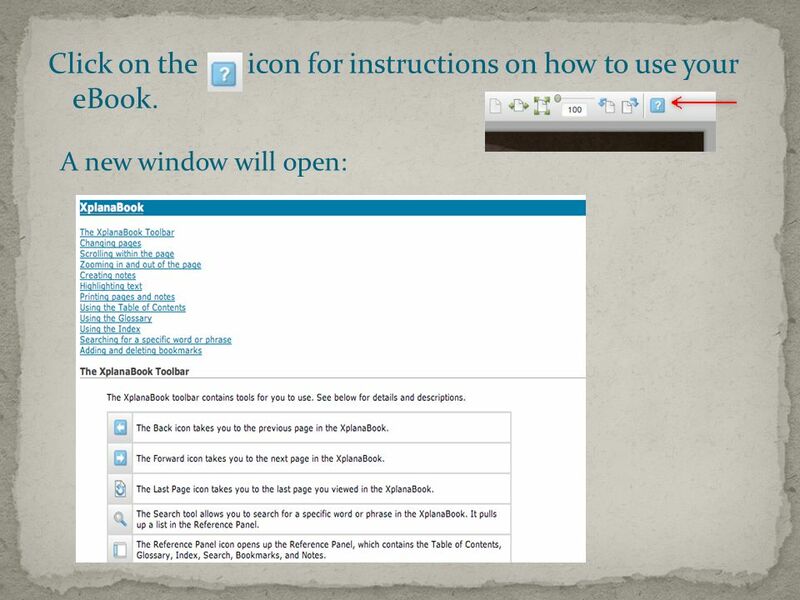 CONNECTSchool: A web-based program that includes a searchable eBook, interactive teaching.  hyperlinks  Audio Recordings  Video  Podcast  Text  Illustrations With creative book builder you can create interactive books that include. Homework Help Homework Help is a website, sponsored by the Ministry of Education, where students in grades 7 through 10 may go to receive help with math. Welcome Course name Faculty name. Your course materials Solomon/Berg/Martin Biology, 8th Edition You will… —be tested —receive homework assignments —have. 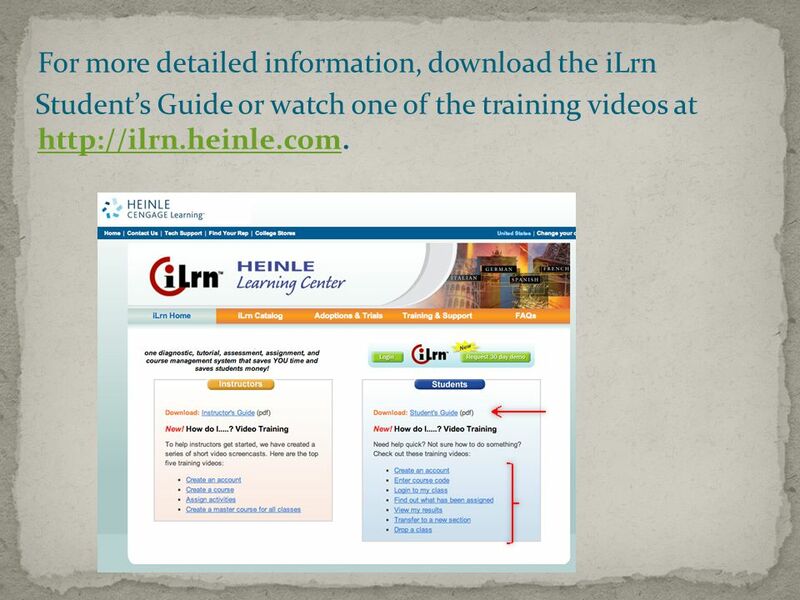 Online Course Platforms Birgit Deir. Online Course Platforms: What is it? 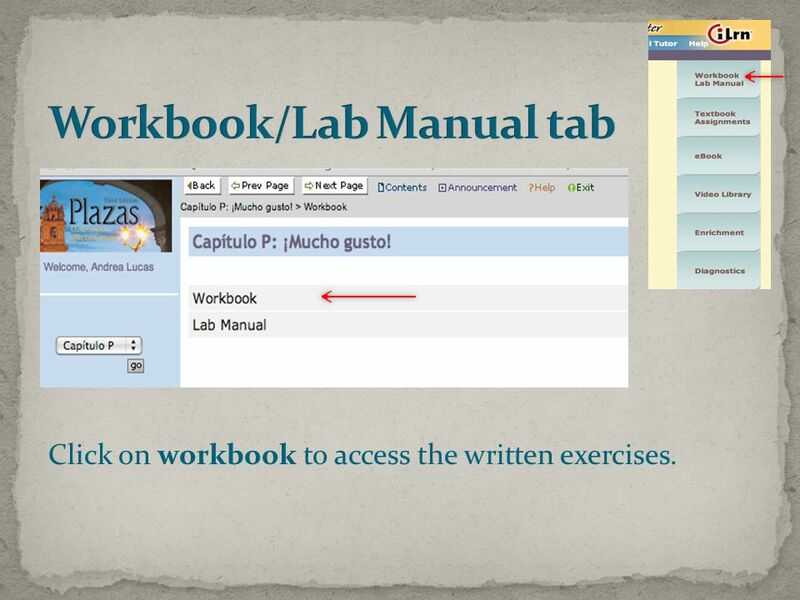 Course material has been made available online Textbook Workbook Lab manual. Welcome to (Insert Course info) Use Your Required Materials and Own Your Grade. Digital Books and Hot Technologies BAM Conference October 2012. Copyright © Allyn & Bacon (2007) Using the Student Resource Website Graziano and Raulin Research Methods: Appendix A This multimedia product and its contents. What do I do in the Foreign Language Lab? 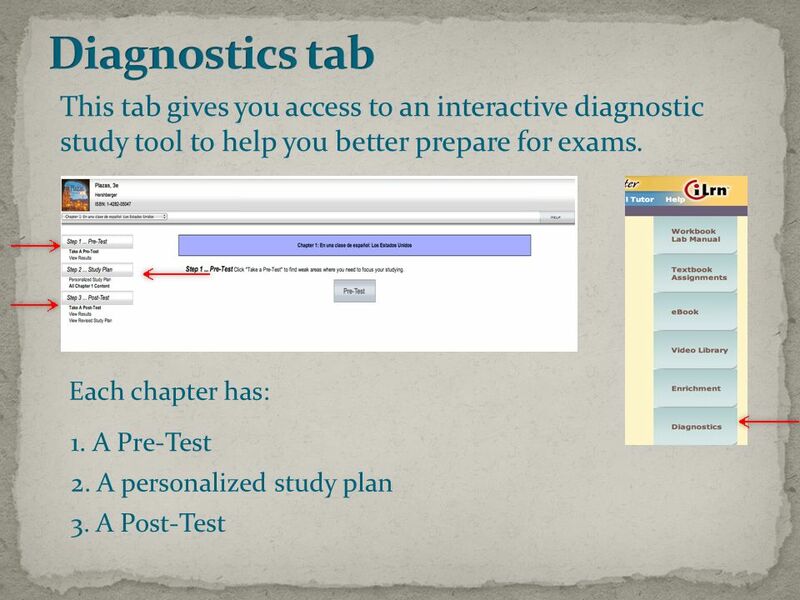  While you are scanned in at the Skills Center, you may work only on your Spanish lab assignments.  Your main. French 101 and French 102 Resources for Students. Centro Online Lab Manuals, Workbooks & eBooks Student Registration Process 7/2008. 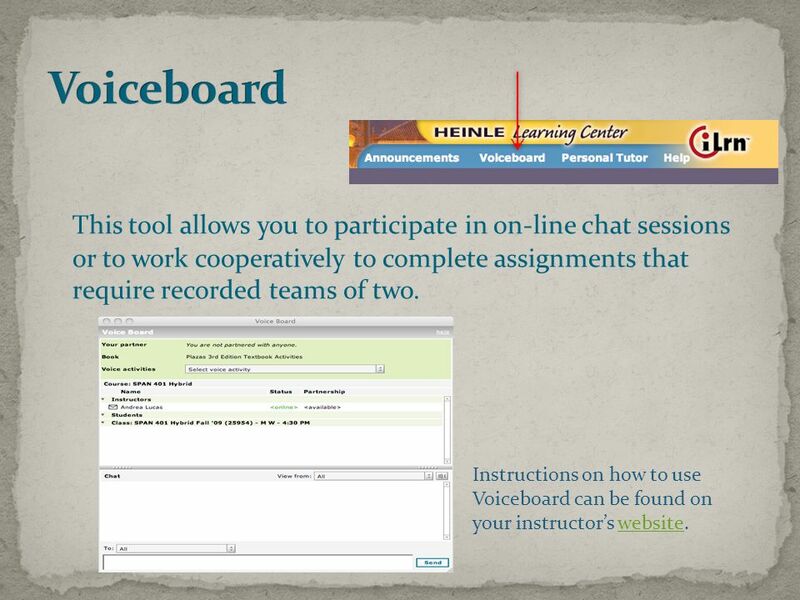 Virtual Field Trip: Online Learning Kimberly A. Yuretich. Jones & Bartlett Learning eLearning Solutions Navigate Course Manager: Respiratory Care, Principles and Practice. German F.C. Skills Center Resources for Students.